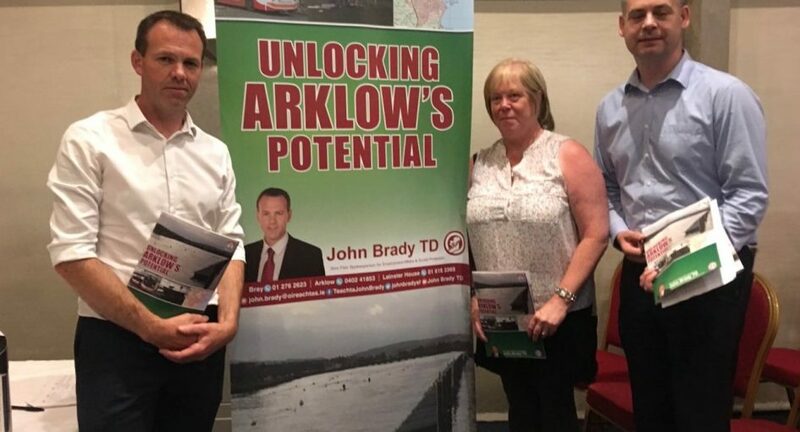 Wicklow Sinn Féin TD John Brady was joined on Wednesday evening in the Arklow Bay Hotel by the Sinn Féin Finance spokesperson Pearse Doherty to launch a document entitled ‘Unlocking Arklow’s Potential’. Over 100 people attended the meeting to see the new discussion document which came about following extensive consultation with the public and key stakeholders. The report looks at a number of different areas in Arklow and makes recommendations that “if only a fraction were to be implemented would go a long way to unlocking the massive potential that the town has” according to Brady. “The lack of a sewage treatment has had a negative impact on both the economic and residential development of Arklow, it is anticipated that a planning submission will be made to An Bord Pleanala will be made over the next few months. One of the issues the document addresses is the lack of sewage treatment in the town, which Brady says has had a negative impact on economic and residential development of Arklow: “This in itself will act as a catalyst, helping unlock development that has been stifled by the lack of a water treatment plant. Other key infrastructural projects the document touches on is the construction of a Deep Sea Port at Arklow Rock, a port access road and slip roads on and off the M11 to the Avoca Road. “The report also makes a number of recommendations to help employment in the Arklow area, which still has very high unemployment rates and is a youth unemployment black spot. Some of the key proposals include a new Occupation of Vacant Commercial Premises Incentive Scheme, also an extension needed to the Arklow Business Enterprise Centre,” Brady continued. “The plan offers some ideas and ways in which I feel that Arklow can grow. I hope this document will serve as a conversation starter for the people of Arklow and all those who wish to see it develop and thrive in the months and years to come.